Whoohoo! Party time! 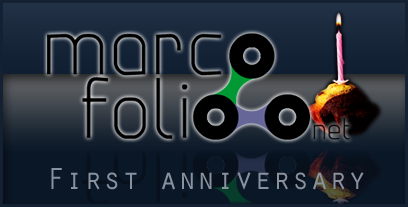 Today (9th of May, 2008) is exactly one year after I bought the Marcofolio.net domain. Meaning, today is the first birthday of this website. I'm pretty satisfied with what happened the past year. The first couple of months, this website was nothing more than my personal portfolio. After a while I started blogging and even made a pretty nice list with my favorite articles from 2007 and even made an april fools prank. Because of the increasing number of readers, I updated my layout for the website to version 1.5. Recently, I became #2 top blogger under 21. For all my articles, you can go to the sitemap. As a little present for you, I added Gravatar support in the commenting system. This way, your comment will be more personal with your own avatar. Also, for the RSS Feed Readers among you, using a RSS Reader like Feedreader: The feed will now display formatted HTML. This way, you'll get a faster intension of the article (image & links) and it looks a lot nicer. I apologize to those people who got "double messages" in their feed reader: It happens when you change the Feedburner Feed. And don't you worry: I'm here to stay for a while. On to the next celebration of Marcofolio.net! Oh and if you find any errors because of the changes, please contact me.